A 12-year-old Waltham boy was seriously injured after he was struck by a dump truck while riding his bike this morning. According to police reports, the young man was hit near Pine Street in Waltham by a 22-year-driver of a dump truck. The boy was not wearing a helmet at the time of the accident, and was conscious when rescue officials arrived at the scene. He was flown by helicopter to Children’s Hospital in Boston to be treated for severe head and elbow lacerations. With school back in session, it is important for drivers to be aware of the extra foot and bicycle traffic on the roads during the morning commute. This instance is an unfortunate example of how inattention can lead to a serious accident, injury, and sometimes death. Pedestrians and bicyclists are extremely vulnerable compared to passengers to a motor vehicle because they do not have any physical barriers to protect themselves if they are hit by a car, truck, or any other vehicle or object on the road. Boston and the surrounding Massachusetts communities, like Waltham, are filled with activity and traffic that pose serious threats to pedestrians’ and bicyclists’ safety. Broken bones, serious cuts and lacerations, bruises, skin burns, spinal cord injuries, brain injuries, and even death are common injuries of pedestrian and bicycle accidents. •	Always wearing a helmet while riding a bike. Helmets are the most practical way to prevent a serious head or brain injury in the event of an accident. •	Wearing bright or reflective clothing, carrying a flashlight or wearing a flashing headlamp when walking or riding at dusk and at night. Wearing dark clothing makes it harder for drivers to see, but wearing reflective clothing will ensure that you will be better seen by vehicle operators. •	Walk on sidewalks whenever possible or walk against traffic when there are no sidewalks. •	Ride in designated bike lanes, use proper hand-gestures to signal turns, and follow the rules of the road. Remember that bicyclists must follow the same rules as cars. •	Cross at designated crosswalks and avoid jaywalking whenever possible. •	Yielding to the right-of-way to pedestrians crossing streets in marked or unmarked crosswalks. •	Yield to pedestrians and bicyclists while turning at intersections or onto another street. 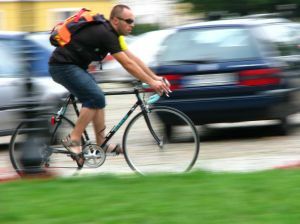 •	Being vigilant and aware of pedestrians and bicyclists walking/riding at night, when it is dark. When a pedestrian or bicyclist is injured during a motor vehicle accident, there are a number of legal repercussions that can complicate a person’s recovery. Victims and their families may wonder who is responsible for paying medical bills, lost wages, and what to do if the accident was a hit-and-run. All of these concerns can be handled by the help of an experienced Boston Personal Injury Attorney, at the law offices of Altman & Altman. Our seasoned attorneys have nearly 50 years of experience handling pedestrian and bicycle accidents and we have all of the necessary resources to achieve the highest possible settlements for clients. If you or someone you love was the victim of a pedestrian accident, contact the offices of Altman & Altman to schedule a free initial consultation. Our lawyers are always available to answer any and all of your questions.